Jordan Brand is rolling out a plethora of Air Jordan 4s this year in celebration of the iconic sneaker's 30th anniversary. In addition to all-time classics like the "Bred" colorway, Jordan Brand also plans to release several never before seen colorways, such as this upcoming "Monsoon Blue" joint. The iridescent build consists of "Monsoon Blue, Armory Blue, and Melon Tint," while light grey handles the wings, netting and laces. Additional details include a black inner lining and heel tab, a white midsole, and a semi-translucent purplish-blue outsole. 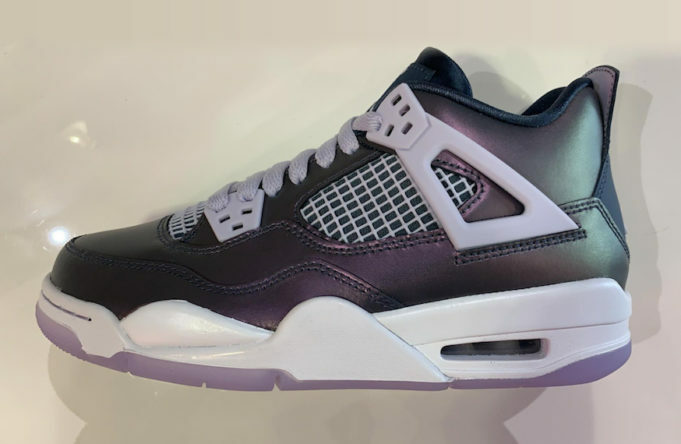 Jordan Brand has not yet revealed official images of the "Monsoon Blue" Air Jordan 4, but it is believed the kicks will be available starting April 6, for the retail price of $140. As the price indicates, these will be a GS-exclusive, available only for girls, kids and toddlers.